ECHINODERMATA : OPHIURIDA : Ophiuridae STARFISH, SEA URCHINS, ETC. 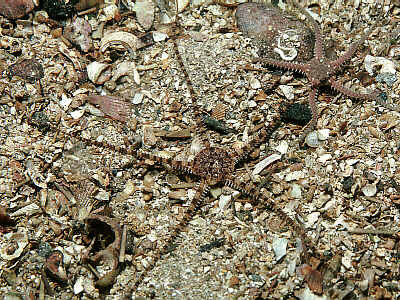 Description: A small active brittle star with banded arms. Usually grey in colour with darker bands on the arms, which are not as tapered and longer relative to the disc than in other Ophiura species. The disc is covered with large circular plates edged with smaller plates. These small plates are often darker than the large ones, emphasising the pattern on the disc. There are arm combs of 7-9 short flat papillae and 3 slender arm spines. Disc 6mm., arms 4.5x disc diameter. Habitat: Lives on silt-covered rocks and firm silty substrata. Distribution: In shallow water this species has been found abundantly in some Scottish sea lochs. It has been recorded from deep water all round the British Isles. Similar Species: Other Ophiura species are similar but generally have shorter arms. Banded arms, actively moves over sediment when disturbed. Primary plates on disc ringed with small secondary plates. Picton, B.E. & Morrow, C.C. (2016). Ophiura affinis Lütken, 1858. [In] Encyclopedia of Marine Life of Britain and Ireland.